Yet another example of why we should NOT be arming, advising, or in any way helping the Syrian rebels. Assad is horrible but these guys are far worse. After spending two years in Saudi prison for fighting in Iraq, Khalid al-Suwid graduated in 2012, a free man, from the kingdom’s well-regarded rehabilitation program for religious extremists, Saudi officials said. Mr. Suwid was a government-certified ex-jihadist. Mr. Suwid turned up again in a photo released in mid-March, smiling, holding an assault rifle and wearing what appeared to be a bomb vest. It was a so-called martyrdom notice, announcing his death in Syria. Mr. Suwid “killed a large number of Christians before his acceptance by God,” said the notice, which appeared on a Facebook page—”Foreigners in theSyrian Revolution”—that anonymously records and lauds foreigners killed fighting Syrian leader Bashar al-Assad. The devil/Muslim savage we know is preferable to the devil/assorted Muslim savages we are backing, who we know are Al-Qaeda/Muslim Brotherhood. Oh, and by the way, morons, like Slobbert Spencer and his car-loan fraud scamming crook of a girlfriend, want us to back the scumbag rebels. Islam is always the same no matter which direction you look. I disagree that they are morons. However they are greedy and immoral. I believe they do this for publicity that will eventually generate into $$. Assad is a known quantity. There isn’t much to like about his alliance with Iran and Hezbollah but he knows his limits. The Muslim Brotherhood and Salafists who dominate the Syrian opposition don’t. My position is we shouldn’t pick sides, we hope they kill each other forever and they both lose! That’s exactly what we’re doing now. There are no Syrian democrats in sight in a post-Assad future in that country. The Obama administration has probably already secured their victory through the Arab spring initiative while most were picking their noses and nodding in agreement about the wonders of social media. The west believed what it needed to believe and will continue to do so until it winds up like Kashmir. Far from fighting each other forever(ha ha) the rebels will be much stronger and more deadly thanks to US training when they are finally victorious. The Obama administration is now doing its utmost to make certain of this outcome by ignoring UN findings that the rebels used chemical weapons. As always, they know so much better than everybody else about well just about everything. If you think they wouldn’t do something like that then you haven’t been paying attention. This is a mafia administration. You can’t fight a long term strategy with short term expediency. …I am glad I do not read or even look at anything those two freaks publish. If you’re a regular here, you should know why their opinion is foolish and trifling. Go to the head of the class. I would NOT put it past Assad to use chemical weapons BUT why isn’t the media ever saying definitively that he is? I find that questionable (he either IS or isn’t and someone should know or not know). I don’t believe he has yet. I believe the word is being spread that he is so USA can get involved. That’s just my hunch. I’d love to hear what others who know more than I do think about the chemical weapons issue. We should supply both sides with weapons, then sit back and enjoy the show. We should also wish both sides great and perpetual success until the NOT bitter end. Great minds think alike! That ought to be the exact limit of our involvement in the Syrian civil war. The media is not saying he definitely did because there’s a lot of evidence to suggest he isn’t. In fact there are UN reports. Plus the town attacked was friendly to Assad and his own soldiers were among the casualties. We know the insurgents(Al Qaeda) have the rockets. And they can use them. It also doesn’t make sense for Assad to use them because he knows this will force the US to intervene. I support Assad because the administration doesn’t. That’s Al Qaeda he’s talking about. The UN thinks the insurgents(Al Qaeda/Muslimo Brohoods) have used Chemical Weapons. We know that the insurgents have them. We know they can use them. The administration says that they “know” otherwise but almost everything they “know” simply isn’t so. Thank you, Frankz. I’m glad I am not the only one who thinks that. I am not keeping too keen an eye on Syria because I want the 2 warring sides to decimate each other but from what I have learned here & using my deductive reasoning, I do not believe he is using chemical weapons at this time. I don’t expect the average Yank to understand what is happening in Syria. It’s just not how the rotting brains of US citizens work these days. Too bad. I don’t like the US intervention in Egypt, Libya or Syria…not to mention the huge errors of Iraq and Afghanistan. I just see Mooooslims winning since September 11. 2001 and it’s not a good thing. The American life is rotting on the vine ever so slowly as are American freedoms. Wait a minute Debbie are you saying that both Geller and Spencer want US troops to go into Syria and help out the so-called rebels? If so, then this is no different than two years when Sean Hannity, John McCain and some Republicans who urged Obama to send US troops into Libya and assist the rebels in Libya to overthrow Gaddhafi’s regime before he was killed. And I don’t mean to sound like a conspiracy-truther, if Geller and Spencer wants us to go into Syria and help the rebels, maybe, just maybe their being paid off by the “Military Industrial Complex” in this country? You never know! I don’t think even this administration is crazy enough to send US forces to fight alongside Al Qaeda insurgents. Thankfully even they are probably not that cynical yet. They might go along with some kind of UN intervention. Tactical air strikes. More training. I think there’s reports they’re providing shoulder based anti aircraft rockets. That kind of thing. I’m really concerned more about their long term objectives in the region. Debbie I support whichever side is losing in Syria. More importantly I support you, Debbie. You’re a real eshet chayil (woman of valor). I love you like I love the Israeli Air Force and Federal Holidays. I dont agree with this post. Yes the rebels have a growing elemt of islamists which are barbaric. they are a threat to the minorities But Assad himself is infinitely more brutal. i Believe obama or israel should have gotten rid of assad by any means necessary early on before it became a civil war. the assad family is even worse in it’s brutality than the opposition. i remember reading how former syrian defence minister Mustafa Tlass was gloating of how his soliders beheaded 23 captured israeli pow’s during the yom kippur war. those rebels have had a good teacher. let us also not forget the thousands of foreign fighters who were trained by syria to go blow themselves up in iraq and behead people there. and btw assad is the hero of the resistance along with the vile dog nasrallah here in dearborn. cursing either one would mean big trouble. believe me. I called assad and his lapdog nasrallah out for what they are and got into a fist fight today. the atmposphere of blind loyalty coupled with threats to those dislike hezbollah is rampant here in dearborn. dearborn is a haven for moral and finicial suppourt to those terrorist’s and im sick and tired of being the only one here to say this. What America and Americans fail to understand is that we are at war, or at least, war has been declared on us. Whether we fight back or not doesn’t really matter. It’s a social, economic, ideological, and yes, a religious war; perhaps more so than the others. This war is being waged through bombs and through babies, that is, immigration and terrorists. It is in a sense both a soft war and and hard war against anyone not Moslem, be it Jews, Christians, pagans, atheists, Hindus, Buddhists, or whatever. It is being waged against Europe, Russia, Asia, Africa, and everywhere in between. It will not end until it becomes to costly for them to wage war or there are no suvivors to oppose them. I happen to know a Christian lady whose sister( a widow of an Orthodox Christian church deacon) and her 2 children lived in Homs, Syrian. They were chased out by the rebels and somehow the Syrian Army helped them and others to get to the border of Lebanon. These people are now in Lebanon and living like “rats in a shack” according to my friend. My friend is trying to get help to get to Austria where another relative has lived for about 20 years… AUSTRIA does not help at all. The UN is NOT actually helping the Christian refugees. So I guess it is just OK for the USA to give weapons to rebels who kill Christians and brag about it. And everybody in the West just to turn a blind eye to the plight of the Christians. Oh well what do I expect from an idiot like Obama and the morons at the UN? ALL of the Christians are being driven out of the muslim world, even from places where they lived centuries before islam existed. Islam is antithetical to limited government and freedom, and even to the right of Christians to merely exist. What more does anyone need to know to support kicking them all out of the US permanently? What benefit do we get from them? They already have plenty of muslim countries, just for them. Get them out of the US. I think that got about 2 minutes of coverage on TV. It was called a “clash of values”. They didn’t really spend too much time on what the value clash problem was. Few reticent shots of riot police looking intimidating. Nothing else to report here. Apparently 20 people were beaten to death by angry mobs to enforce sharia. In France there are “751 Sensitive Urban Zones”. These are actually Islamic no go zones meaning that the police are afraid to go there. Arming the Syrian rebels ??? 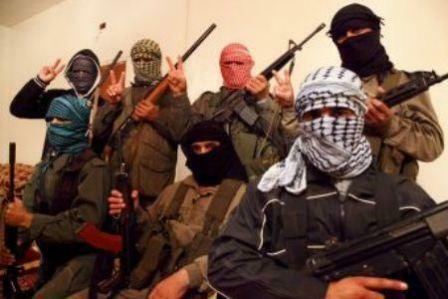 The third terrorist from the left is equipped with an M-16 !! I had to share this-from todays emails; it is so funny, but so true. “I am truly perplexed that so many of my friends are against another mosque being built in Toronto . I think it should be the goal of every Canadian to be tolerant regardless of their religious beliefs. Any doubts still about the mafia moron queen Hilary Clinton though? Can someone explain to me what’s with the “peace sign” in Arab countries? Seems awkward flashing the peace sign while holding a machine gun. No, actually sounds moronic. You are a very cruel people to watch all those human beings die and yet you wish for more killings. But one day these Muslims will rise up against Zionism and your like. The world changes just look at the crusaders who occupied Jerusalem for eighty years and were defeated. Assad will be defeated for Allah is on the side of the rebels. Syria has been ruled by a nazi like regime that has tortured and oppressed there people. The rebels are not Al Qaida but are syrians who want freedom and justice . You right wingers will never defeat the great religion of Islam. The more you attack this great religion the bigger it spreads. As for you Debbie keep spreading your Zionist propaganda for Allah will surely take care of you in the end.